Recently, my daughter called me and said that she had an intractable pain, earache, ringing, hearing loss and stuffiness in her ear. Her doctor had recommended that tubes be put in place; she had also tried three series of antibiotics. Finally, she called and asked for recommendations. I have a Chinese Herbal Medicine practitioner working with me and she and I with the help of the Herbal Studies Course came up with this treatment for stuffed sinus, ear pain and infected Eustachian tubes. This treatment worked very well – no tubes, clear ears and no ringing. cang er zi, in Chinese, and Xanthium sibiricum, in Latin, aka – Cocklebur Fruit in English. Xanthium is an invaluable herb for the treatment of acute and chronic rhinitis and chronic paranasal sinusitis. It is relied upon to open the nasal passages and clear out nasal discharges. It also helps clear sinus headaches. 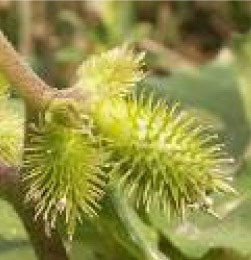 Xanthium is commonly added to formulations that soothe skin conditions with itching, including atopic dermatitis [urticaria] and chronic eczema. Its broad scope of anti-inflammatory and anti-allergic action also makes it useful for chronic arthritis with generalized stiffness and pain. Used for any nasal or sinus problems with a thick, viscous discharge and related headache. Xanthanol, isoxanthanol, xanthinin, xanthumin, linoleic acid. Traditional Herbal Studies would include herbs such as Elderflower, Marshmallow root tea and capsules of Echinacea and Thyme. Drink Oregano hydrosol, 1 t/8 oz of water at least twice a day. Refer to the Aromatic Plant Project for Sources of Hydrosols or to Hydrosols & Aromatic Waters. We also recommend that your quality hydrosols be Copper Distilled. Inhalation of Conifer Kit oils will help to sterilize the entire respiratory system of bacteria and virus. It will help to keep the passages clear. Gentle massage around the nose and eyes to stimulate the sinus to drain. Use Rosmarinus pyramidalis (Rosemary CT pinene). See Colds and Flu Kit. Simplify your diet; get rid of any fast foods and/or ‘heavy’ food. Go on a juice and soup fast for a week. The steam and heat of the soup will also help to clear the passages. Practice YaoShan that is Chinese Traditional Medicine as Food. Fennel Beef would be a good choice here as it relieves cough, is expectorant and soothing! 1/2 oz Fennel seed and water. Stir fry Sesame seed and Fennel seed, grind to powder, roll beef in this powder, steam, roast or stew in water and season to taste with soy sauce and wine and a touch of Manuka honey. Take Nettle capsules, three times per day and especially those with quercitin. Vitamin C and quercitin that will relieve inflammatory response. Any kind of relaxing bath will help especially using salt baths or Dead Sea Salt . Good formulas for salts and baths are in SPA/SKIN Booklet available at the end of the article. ALWAYS use baths, essential oils, hydrosols, dietary supplements and anything that you can possibly think of that will help with your condition. Read! Magazines, books and only the best and most non-New-Age (not woo-woo!) common sense info. EX: If something is beeping and it doesn't have an electric cord attached, then you know that it works on batteries, therefore disconnect by removing the batteries, don't bash it against the wall! The Jeanne Rose Aromatherapy Kit for Colds and Flu has the necessary essential oils for the inhalation and application of the correct oils for this condition. Classes are available that focus on treatments for various conditions. Herbal and Aromatic Consultations are also available. Since 1969, Jeanne Rose has also authored over 20 books including the well-respected 375 Essential Oils & Hydrosols, a complete reference book of plant extracts and hydrosols with phyto-chemical, clinical and botanical indices. Recently, she has produced a workbook on Blending Essential Oils from her popular Blending Class and another transformative book on Natural Perfumery. Jeanne has a unique and mindful approach as she reaches out into the hearts of thousands of readers through her Jeanne Rose News-Online email forum and seminars. In addition to teaching through books and her three home-study courses, Jeanne travels throughout the United States and Canada during the Fall and Spring of each year to teach weekend Seminars on various aspects of aromatherapy and herbalism. be used without the prior permission of Jeanne Rose.